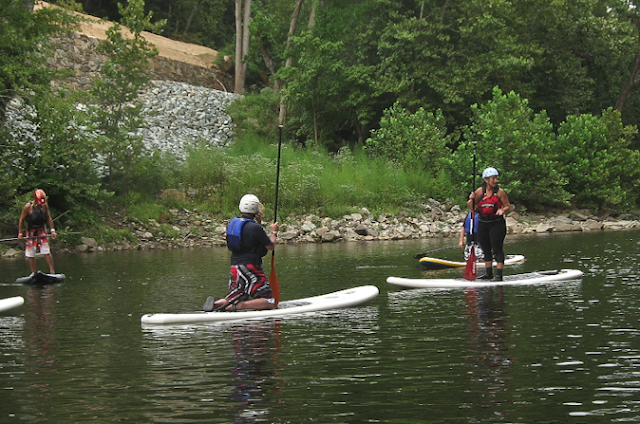 Paddleboarding ~ Learn, Live, and Explore! What better way to spend a Sunday afternoon than learning something new! 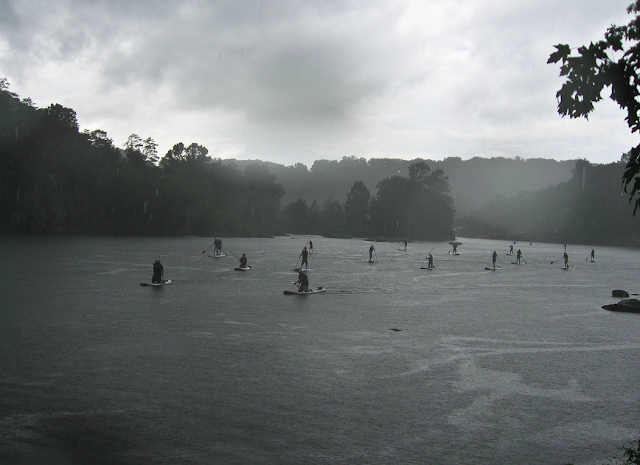 Today's new activity to add to my ever growing adventure skillset was stand-up paddleboarding. 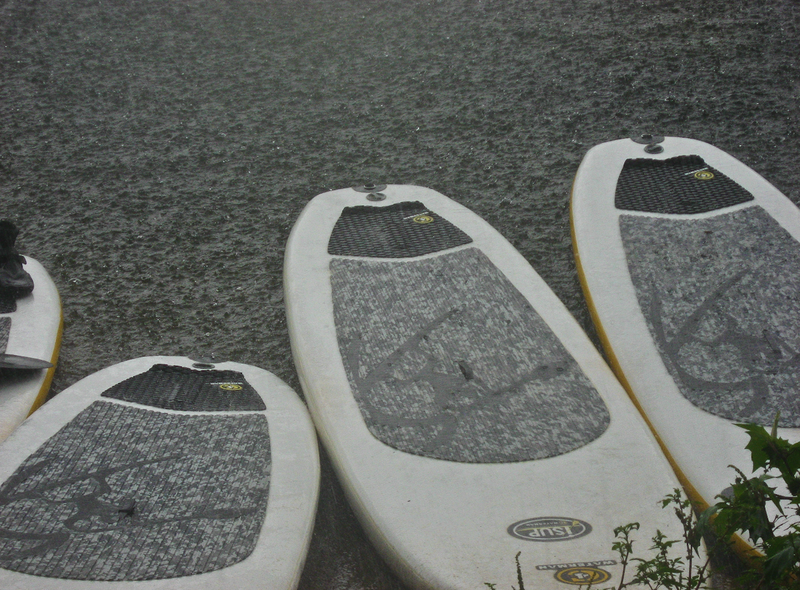 I've seen these paddleboards while on vacations in tropical and warm weather destinations but have never tried it myself. 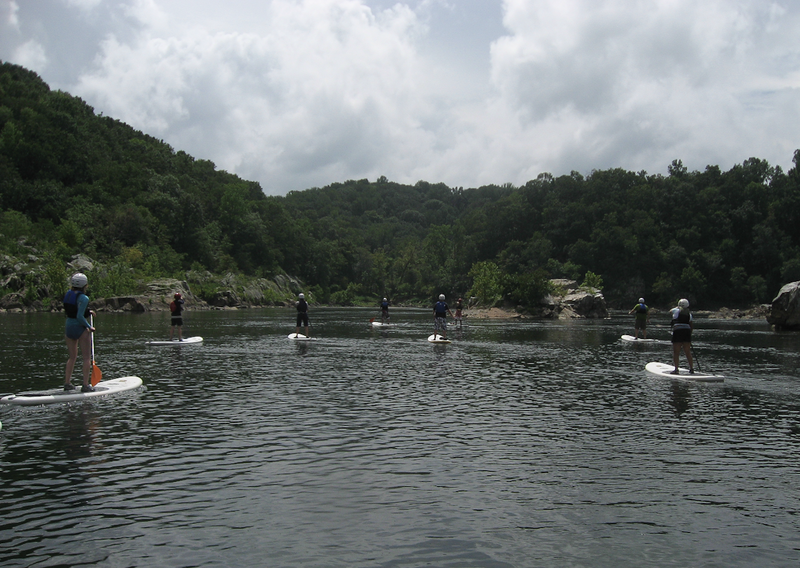 This particular excursion was provided by Potomac Paddlesports, specifically their Stand-Up Paddleboarding (SUP) 101: FUNdamentals course. 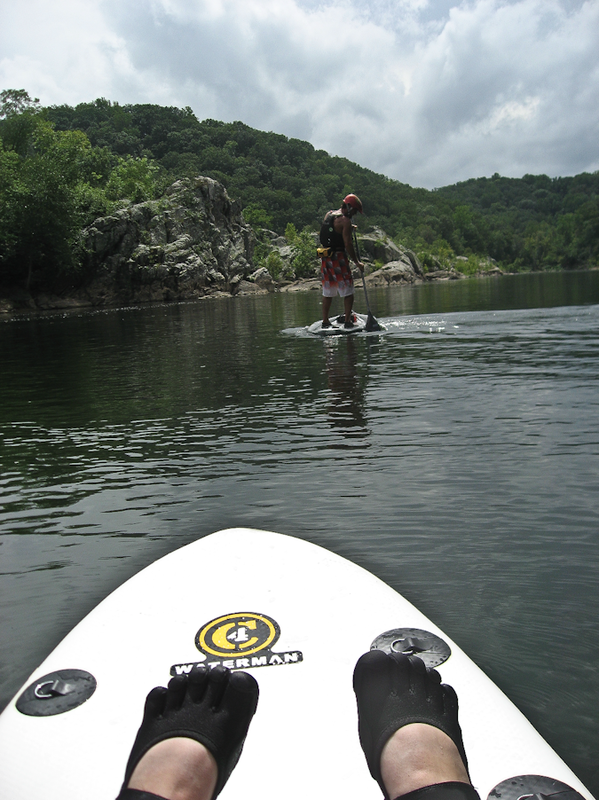 The location is one of D.C.'s most scenic natural area and a favorite for kayakers, river surfers, and paddleboarders - a little south of the popular Billy Goat Trail along the Potomac River near Old Angler's Inn. 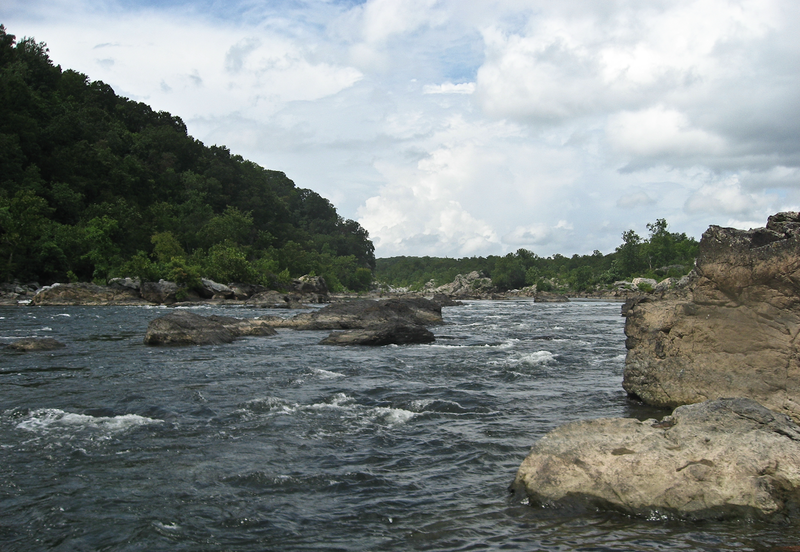 You may remember me writing about the Billy Goat Trail hike earlier this summer. In the class, we learned some basic strokes for forward and backward movements and for turning and stopping. The first module of the course we remained in a kneeling position in order to be able to concentrate on our strokes. 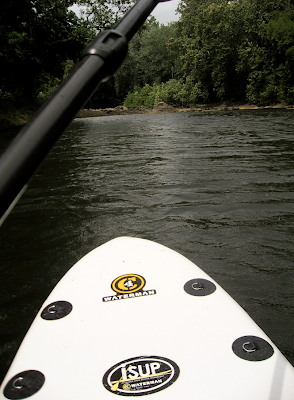 Once we were in a protected area, we covered some safety issues. The main skill was to learn how to properly get back on the board after falling off. There are two methods, but the easiest is to use the center strap and a strong scissor kick to propel yourself back up on the board, or at least your personal floatation device (PFD) - or life vest - so that you can then wiggle into a prone position. A more difficult remounting is from the tail. Once we got the green light, we were then taught a few different methods for standing up on the board from a kneeling position. At first, none of these felt comfortable, but after a few ups and downs, I got the hang of what move was best for me. I think the key is to learn to trust the board, and to recognize that falling off isn't so bad, of course assuming you're in a relatively deep area and not near rocks under the surface. Next we made our way a little up river to where we could try our hand at some swifter currents and very mild white water, learning how to apply the techniques we gained to maintain control of the board. At this point, my earlier issues with aching foot arches and sore calves from constantly balancing my body miraculously dissipated. Maybe I was just feeling more comfortable in my ability to maneuver the board. I recognized the area we were in as a viewpoint on the Billy Goat Trail near the steep vertical climb. If you've hiked it, you know where I'm talking about! 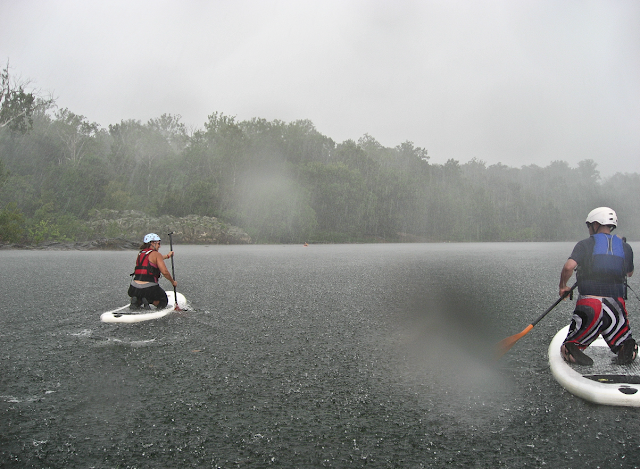 Alas, Mother Nature was not especially nice to us the whole time we were out there. At the first sight of lightning, we started to head back towards our put-in beach. 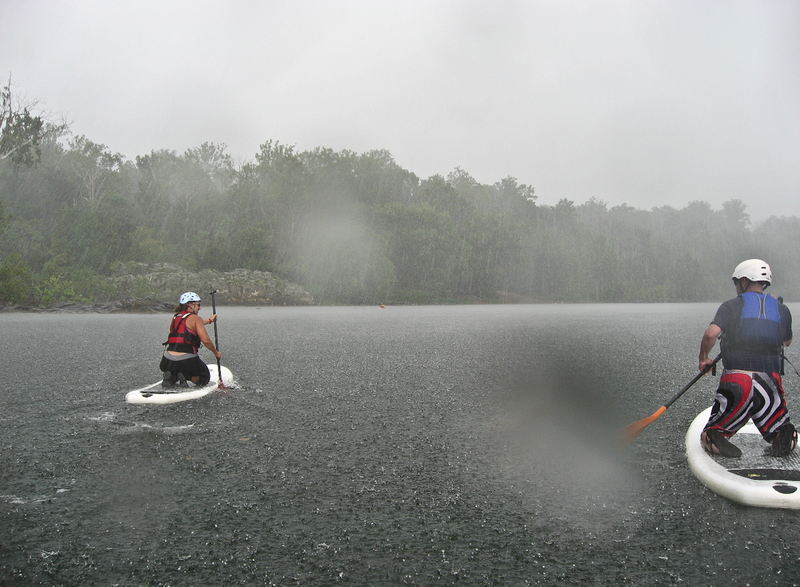 Of course when the wind picked up and the rain deluge began, our instructor said to get on our knees and "oscar mike" out of there. I have a feeling my shoulders are going to be sore after that sprint! Overall, it was a very fun experience, and I definitely want to do more. You not only get a little exercise, but you're nestled in beautiful scenery too. Through the membership at Potomac Paddlesports, you get a two year access to four outdoor lessons, coached weeknight practices that are free with a social hour afterward, all equipment for classes and practice, free rentals, and 10% member discounts. Considering that the paddleboards we used cost around $1200, it's not a bad idea to try it out for awhile before making any investments.